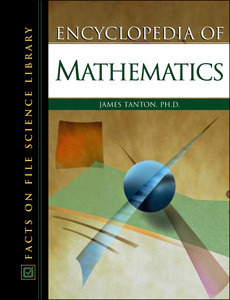 Authored by: James Tanton, Ph.D.
Encyclopedia of Mathematics is a comprehensive one-volume encyclopedia designed for high school through early college students. More than 1,000 entries, numerous essays, and more than 150 photographs and illustrations cover the principal areas and issues that characterize this area of science. In order to provide a well-rounded, completely accessible reference, the author worked closely with teachers of all levels in developing subject material and a sound understanding of mathematical concepts, and on teaching analytical thinking. This valuable resource unites disparate ideas and provides the meaning, history, context, and relevance behind each one. The easy-to-use format makes finding straightforward and natural answers to questions within arithmetic—such as algebra, trigonometry, geometry, probability, combinatorics, numbers, logic, calculus, and statistics—simple. Encyclopedia of Mathematics also gives historical context to mathematical concepts, with entries discussing ancient Arabic, Babylonian, Chinese, Egyptian, Greek, Hindu, and Mayan mathematics, as well as entries providing biographical descriptions of important people in the development of mathematics. "...useful in a high-school library, public library, and academic library as a basic resource for students who wish to have a better understanding of simple or not-so-simple mathematical concepts." "[This] comprehensive [resource] cover[s] important discoveries and definitions of basic terms and concepts, and offer[s] short biographies of leading scientists." "Aimed at high school and college students, this encyclopedia not only covers recent discoveries and basic terms, but also explains the importance of mathematics to society." "...comprehensive...recommended for libraries that serve high school and undergraduate students."